Raising the age of juvenile justice in North Carolina this year is going to come with a steep price tag, but there are 20,000 kids with their futures at stake counting on the adults in charge to get it right. “Raise the Age” will be officially implemented in December, which means that 16- and 17-year-olds charged with most crimes in this state will be prosecuted as juveniles and not adults. They will be housed with other juveniles and not adults. They will get the same opportunities, education and classification of criminal records that their peers have been afforded all along. Even though North Carolina is the last state in the nation to treat 16- and 17-year-olds like juveniles, Raise the Age has been years in the making. And while the past two years of planning in particular is finally coming to fruition, it’s what comes next that will be key: the resources, a.k.a. the money. The legislature has already invested a “down payment” on Raise the Age, as William Lassiter likes to call it. Lassiter is the deputy commissioner of Juvenile Justice in the Division of Adult Correction and Juvenile Justice, and has been a dedicated point person on implementation. He’s also a member of the Juvenile Jurisdiction Advisory Committee  (JJAC), which has been meeting since December 2017 to work on all things Raise the Age. At the most recent meeting Tuesday, members agreed unanimously to adopt the final legislative recommendations  to implement the juvenile justice change. Lassiter said he believes lawmakers will prioritize the funding needs for Raise the Age  because of the bipartisan support it’s received, and because so many stakeholders were involved in the recommendation process. He also pointed out that Juvenile Justice as a whole has been saving the state about $50 million per year by reducing commitments and detention confinements of juveniles. He said the 2008 Juvenile Justice budget was $178 million and the budget last year was only $127 million. “We need to reinvest that money into the system to save this additional 20,000 kids,” he said. Bill D. Davis, co-chair of JJAC and a representative from the juvenile advocacy committee, said the resources will be key to implementing Raise the Age smoothly. He said there are a lot of people working behind the scenes to prepare for the change in December. Stakeholders include law enforcement, district attorneys, defenders and juvenile justice professionals. Davis said each of those groups have been having their own meetings and bringing their own recommendations to the committee, which have been incorporated into the document that legislators will receive Jan. 15. Establishing a “beyond a reasonable doubt” standard for finding an offense was committed as part of criminal gang activity. Lassiter said without some of those final legislative decisions on the non-funding recommendations, Juvenile Justice is in limbo. “Once those final legislative decisions can be made, we can make all the final plans, and we can do all the final training that we need to do for stakeholders,” he said. They’re working to make sure those decisions are made early this session, he added. Other preparations for December include planning at the department level and working out kinks with stakeholders across the state. Juvenile Justice is planning for the use of about 300 detention beds across the state to implement Raise the Age. This includes the use of new facilities, renovated facilities and contracts with current facilities. 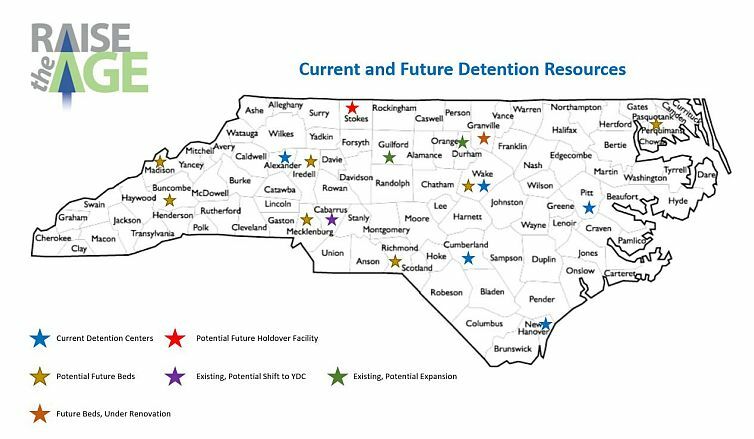 The map provided by the Juvenile Justice Advisory Committee (JJAC) details the current and future detention resources. Lassiter said Juvenile Justice is planning to use about 300 detention beds across the state to house juveniles brought into the system. The C. A. Dillon Youth Development Center in Butner is being renovated, and there’s another facility that will be built in Rockingham County. There are also proposals in Perquimans and Richmond counties to re-open old juvenile facilities closed in 2010. “I think we have identified all 300 beds across the state, we’re just in negotiation with all those counties right now to make sure they can meet the standards: the sight and sound separation, the educational standards and the mental health standards that we expect in a juvenile facility,” he said. One area that will likely require fine-tuning before implementation is school-justice partnerships, programs focused on keeping kids in school and out of court, and juvenile crime prevention councils , programs that bring together community stakeholders to prevent juvenile crime. 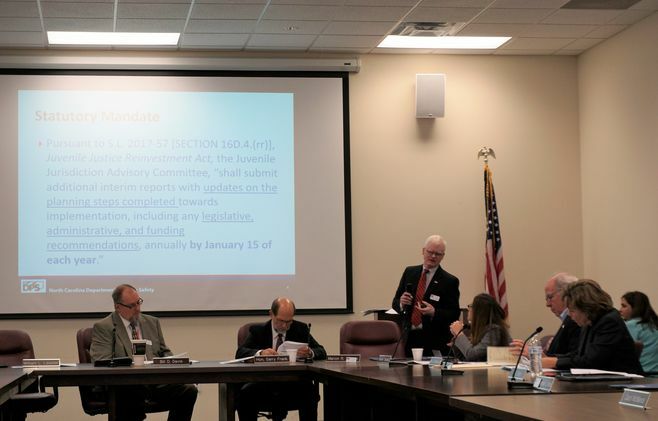 North Carolina Sheriffs’ Association Executive Vice President and General Counsel Eddie Caldwell attended the JJAC meeting Tuesday and said there was some concern that the language in the bill with regard to school-justice partnerships  was vague. “We have yet to find anyone who knows what it means or how it got into the budget,” he said. There is currently a successful program implemented in New Hanover County, but Caldwell said the Sheriffs’ Association worries that there will be difficulty replicating it across the state without the concept being defined clearly. “I think the big issue in addition to the vagueness of it all, it goes contrary to everything this community has been working on,” he said. He said Raise the Age was meant to put kids who need help in the system so they can use more resources to turn their lives around. The school-justice partnerships, he added, says not to put kids in the system at all. Caldwell said he believes the legislative report and recommendations for JJAC was the “wrong vehicle” to address the issue. District Court Judge J.H. Corpening II, who serves on JJAC and the school-justice partnership subcommittee, disagrees wholeheartedly. The New Hanover program was established under his leadership and has transformed the schools there, he said. The county has reduced its school-based referrals to the courts by more than 45 percent since the program’s inception. Caldwell said the Sheriffs’ Association was supportive of the New Hanover County program but remained concerned about other areas. He added that the report from the field is that not everyone was giving the program due diligence. The committee decided ultimately to leave their school-justice partnerships recommendations in the report, but Corpening invited Caldwell to the subsequent subcommittee meeting to work further with the team. 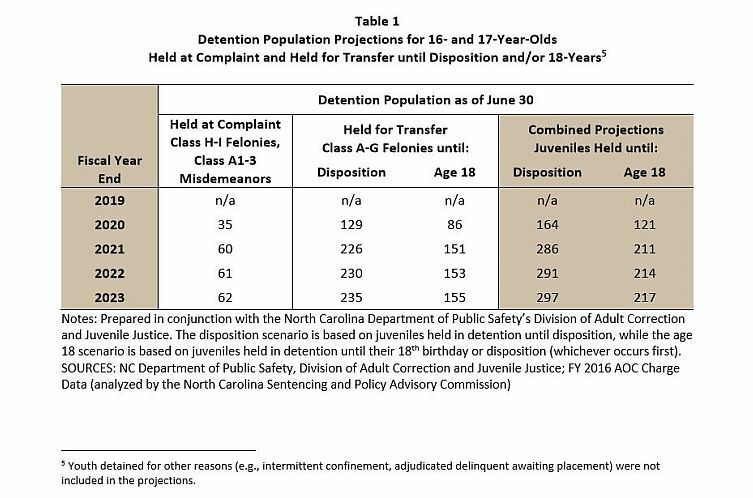 The table provided by JJAC shows the five-year projection for 16- and 17-year-olds who will be detained by juvenile justice after the implantation of Raise the Age. 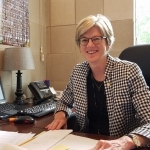 Rep. Marcia Morey (D-Durham) said she also anticipates there will have to be a lot of work with the school systems to implement school-justice partnerships. “There still needs to be a lot of dialogue and understanding about what the roles are about,” she said, adding that there shouldn’t be any stepping on law enforcement’s toes. Morey served as a district court judge for 18 years and a chief district court judge for five years and worked specifically with juvenile justice stakeholders to find better ways to deal with 16- and 17-year-olds charged with crimes before Raise the Age. 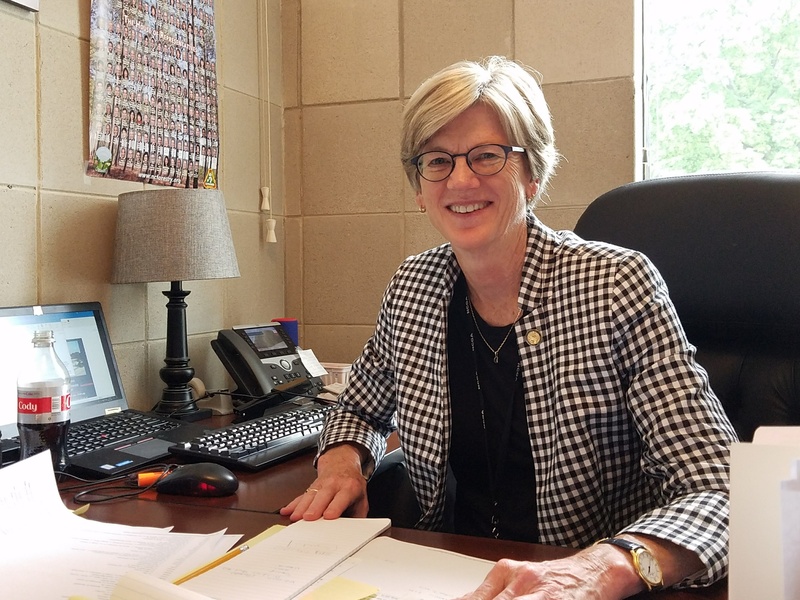 She said one of the main reasons she left the bench to become a lawmaker was to help implement Raise the Age and support the juvenile justice system as a whole. Lassiter has personally met with lawmakers and traveled to every single judicial district across the state to meet with judges, district attorneys and law enforcement representatives to talk with them about what’s coming in December and to hear and address their concerns. He said the anxiety was a natural reaction to change. Lassiter said those people who are affected by the change are still preparing for it and that their number one concern was resources. But, he added, if they get the necessary resources, they will all be “absolutely on track” for implantation. “I think that the general public should feel confident that there’s a lot of work that’s been going on to plan for and get people ready for this change,” he said.